You are here: Home / Fashion / What Type of Fabric is Used in Fire Resistant Clothing? What Type of Fabric is Used in Fire Resistant Clothing? You might be familiar with the term FR clothing. FR stands for fire resistance and they are an integral part of workers safety program. Different variants of flame resistant clothings are available in the market depending on the needs of the user. If your work environment is considerably dangerous, your company will make it a compulsion to wear these clothes for safety measures. Now, you might wonder what are the fabrics used in the flame resistant clothes that provides you safety against pyro hazards. In this article we will discuss the materials that are commonly chosen as flame resistant fabrics. When it comes to resistance to fire, certain fabrics show high resistivity even under significant exposure to thermal energy. This properties make them a great choice for flame resistant materials. Let us have a look at the list of fabrics used. Aramids fabric are mostly used in the manufacture of fire resistant clothing. Aramids has many properties suitable for their use in FR clothing. Aramids is basically a type of synthetic fibre which has properties like heat resistance, resistance to abrasion, high tensile strength and resistance to organic solvents and chemical oils. All these properties make Amarids a top choice for making flame resistant clothing material. Nylon is another top choice for flame resistant clothing. Nylon fabric have high melting points and resistance to very high temperature. Nylon also has excellent resistance to abrasion causing it to be very durable. Nylon can withstand heavy wear and tear. The compact molecular structure of the material also makes its possess high tensile strength. Nylon also doesn’t shrink easily making it highly suitable for a flame resistant clothing choice. Contrary to popular belief, 100 percent cotton is not flame resistant. Although treated cotton fabric shows flame resistance properties. Even though cotton has high melting points it is prone to combustion. Cotton even hundred percent pure is flammable. Cotton when blended with materials like nylon makes it flame retardant. Nomex is a type of meta aramid fabric material and it is widely used as a flame resistant material.Similar to nylon polymers, Nomex has high thermal and radiation resistance although the material is not as durable as nylon or aramids. Modacrylic is a type of copolymer which is highly resistant to thermal induction. Modacrylic is chosen for a flame resistant fabric due to various reasons. Not only is it thermal resistant but it has high resilience making it highly durable. Since the material can withstand high amount of wear and tear it is chosen as a FR fabric for maintaining the longevity of the clothes. Also the material is quite soft making it comfortable to wear. It can be dyed easily as well. They do not shrink easily and resistant to chemical and organic solvents as well. Polybenzimidazole or PBI fibers are a wide sought after choice for making flame resistant clothes. The melting points of PBI fibers is extremely high and even under significant thermal exposure, these materials do not reach their melting point. Not only is the fabric thermal resistant but it is also quite strong and durable and comfortable to wear as well. FR clothing is a must use when an individual is working in a potentially dangerous conditions. If your work environment is especially prone to fire hazards like flash fires or electric arcs or even exposure to flammable chemical and solvents, then you definitely can’t skip on FR clothing. Safety is of paramount importance, which is why the materials mentioned here are chosen for flame resistant clothing. They make for a great staple for flame resistant clothing. 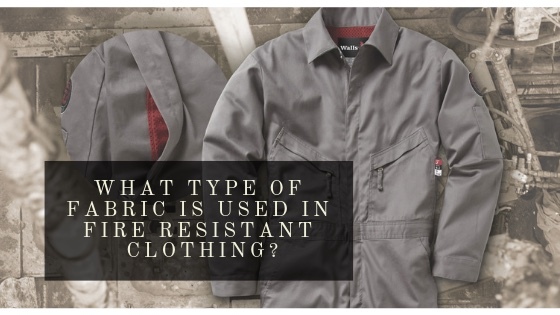 The high high thermal resistance, chemical and radiation resistance as well as their durability and softness makes these materials a top choice for flame resistant clothing.